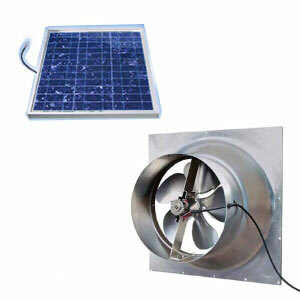 * OVERVIEW: The Solar Powered Attic Fan is constructed of components that include a 20 Watt photovoltaic module, heavy-duty aluminum shroud, D.C. fan motor / blade assembly with motor isolation / support brackets, (2) L-brackets, (4) #8 x 1" self taping screws, (14) 1-1/2" phillips head wood screws, (4) #10 x 1-1/2" SS screws. * CAPACITY: Generates up to 1275 CFM of air ventilation. Suitable for up to 2,000 sqft. attic. * REBATES: Solar Fan may qualify for energy rebates from local electric provider. Check directly with your utility company. * This unit is the best constructed on the market. It is formed with all aircraft grade aluminum and stainless steel. NO breakable plastic shroud components or steel which can rust is used. * PANEL MOUNTING: The solar module attaches to two 12" L-brackets using supplies SS screws. * MOTOR/FAN: Rugged aluminum bracket holds the high grade ball-bearing DC motor and a 12" precision aluminum blade fan assembly inside the vertical section of the base. * GABLE SHROUD: A 21-5/8 inch square heavy-duty 0.080 inch thick aircraft grade aluminum base creates a single attic gable shroud. * MOUNTING SCREWS: (14) 1-1/2" wood mounting screws for the gable shroud are included. * Intake Venting: To be efficient, you will need about 1250 sq.in. net free area of intake venting for each fan. WARRANTY: Manufacturer provides a 25 year warranty. A mail in warranty registration card is included with each unit. Manufacturer provides a 25 year warranty. A mail in warranty registration card is included with each unit. * Options: An optional pre-set, thermostat is available. Fan is set to come on at 85 degrees F. and turn itself off at 70 degrees F. It attaches to a pre-wired pig-tail and can be retrofitted if desired.